Right, that's a wrap for this live text. What a magnificent match and a superb fightback from West Indies. Amy Lofthouse's report of the hosts' 26-run victory here. The scorecard from Barbados is here. Look out for the Test Match Special podcast available soon here. And we'll see you for the third ODI on Monday from about 13:00 GMT. Have a great weekend! Cheers. Will West Indies be unchanged for Monday? They looked perhaps a batsman light at the tail end of their innings, although it proved not to be the case. Having more bowling options definitely worked better for Jason Holder, who rotated them superbly to put the pressure back on England. Eoin Morgan might be tempted to bring Chris Woakes back in for one of Tom Curran or Liam Plunkett. That thriller sets the series up superbly for the third ODI in Grenada on Monday. A slightly earlier start of 13:30 GMT, with Grenada also hosting the fourth ODI at the same time on Wednesday. We're then off to St Lucia for the fifth ODI on Saturday, 2 March at 15:00 GMT. Bob: Cracking game of cricket sadly containing a howler of an lbw decision. This is West Indies' first ODI victory against England since 2014. Quite some resurgence on this tour so far. Shimron Hetmyer's nickname is Hettie. West Indies captain Jason Holder: "I'm really pleased. Hettie set it up nicely with the bat. On a sticky wicket we got a really good total - and credit for the guys for the way we defended it. "It's really good to see the young players stepping forward and leading the batting. The batting is in good shape." Here comes the doom and gloom brigade already! Didn't we chase down 360 the other day? There is no side in international cricket who would be more negatively affected if you took their captain away than West Indies. Jason Holder is so impressive. 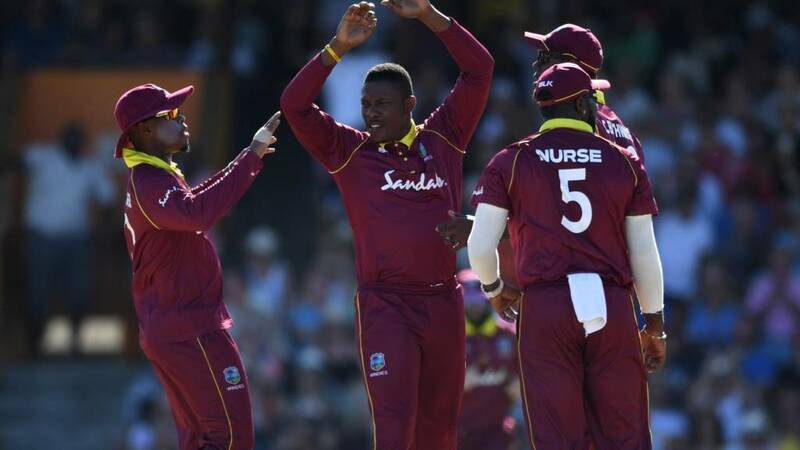 West Indies captain Jason Holder: "When I came back I knew I needed to get a wicket. I just wanted one to get the guys believing. I believed. It gave us the momentum and put England under pressure." England captain Eoin Morgan: "We did a lot of good things today. Two games into the series, we did make a lot of improvements. "We felt that 290 was well within our capabilities. We need to chase a total like that down in partnerships. "We did have partnerships but not significant enough ones. When you get on top, you really need to nail it home - and we didn't do that today." Player of the match Shimron Hetmyer, who hit 104 not out: "It was mainly to just keep going and pick up the slack, try and rotate as much as possible and get a partnership going. "I was trying to open up both sides of the ground while still picking up singles, it's a work in progress for me. "I'm trying to learn some new things and bring them into my game, not be one-dimensional and open up all sides of the field. "My celebration was for my girlfriend - I try to do good things whenever she is around. The guys will be hoping she's always around!" Shimron Hetmyer is named player of the match for his sparkling 104 not out. Must've been a close call between him and Sheldon Cottrell but that was a thoroughly entertaining knock by the 22-year-old. England captain Eoin Morgan: "A game is never won until the end. "We rebuilt really well and guys managed to get themselves in. But we didn't do good things for long enough. We made mistakes and it hurt us. West Indies deserved to win." I don't think England will be too worried by this result though. They did chase down 360 on Wednesday after all. They'd back Jos Buttler to see them home from that position nine times out of 10. This just happened to be the one out of 10. Ben Stokes making a howler of a review and an umpire making a howler of an lbw decision soon after are things you can't legislate for. The West Indian commentators in the box next to us were so loud we could hear them through double-glazed glass. "Give Jason Holder the keys to Kensington Oval!" Pete Hotchkiss: England threw that game away. If that England side turns up in the summer we won't get past the World Cup quarters. Got to close those games out. Credit to Windies for fighting back through. What a match. Superb fast bowling. Challenging spin bowling. Dropped catches. Brilliant run-outs. Momentum swings. Towering sixes. One of the worst umpiring decisions of all time. A good old-fashioned England collapse. Looking back, Stokes' dismissal was key - it shows how quickly a one-day game can get away from you. Stokes didn't think he hit his, reviewed it, and used up the review that would have saved Curran. Suddenly there was a dramatic swing in the match. A collapse the test team would be proud of.